The Schnauzer is fearless, protective, lively, affectionate, intelligent, observant and spirited. Schnauzers are dependable dogs that learn quickly and are eager pupils. They do have a stubborn side, but will respond well to fair and consistent training. Schnauzers make good watch dogs and guard dogs as they are naturally distrusting of people they do not know. 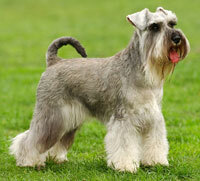 Schnauzers get along well with other dogs and household pets and are very tolerant of children. The coat of the Schnauzer needs to be plucked by hand at least twice a year. Plucking is necessary with most wire-haired breeds as it is the only way to keep both the coat and skin in it's best condition. The excess hair between the pads of the feet should be clipped and the loose hair in the ear canals should be removed. The beard, moustache and eyebrows need regular combing to prevent tangles. The advantage with Schnauzers is that they shed little or no hair and don't tend to have a dog odour. Schnauzers need an average amount of exercise, but they like to be busy and kept occupied. Suitable activities for these dogs include, swimming, running alongside a cycle (once fully grown), agility skills, fly-ball, playing in the garden and running in the woods. If their exercise needs are met, then they should be quite peaceful and calm. It is believed that Schnauzers evolved from German Wirehaired pinschers, black poodles and a spitz-like grey dog. They date back to the 15th and 16th centuries when they were used for herding, ratting and guarding. These dogs were once known as the Schnauzer-Pinscher. General Appearance: Rugged, robust and squarely-built. Color: Salt and pepper or solid black. Coat: The outer coat is wiry and harsh and the under coat is soft and dense. Tail: Set high and customarily docked. Ears: Set high, V-shaped with the tips dropping forward towards the temple. In some countries they can be cropped and carried erect. Body: The chest is moderately wide and the back is short. The belly is slightly raised and the shoulders are flat and muscular. Schnauzers need firm training and early socialization with a variety of people and animals to help prevent them becoming overly protective and dominant.